Writing one hundred years ago this week, then Minneapolis park board president Edmund Phelps, made several observations in the park board’s annual report for 1912 that attracted my attention. The “wheel,” as Phelps called the bicycle, has made quite a comeback. Bicycle riders were generally called “wheel men” then although as this picture demonstrates riding bicycles was not strictly a male pursuit. 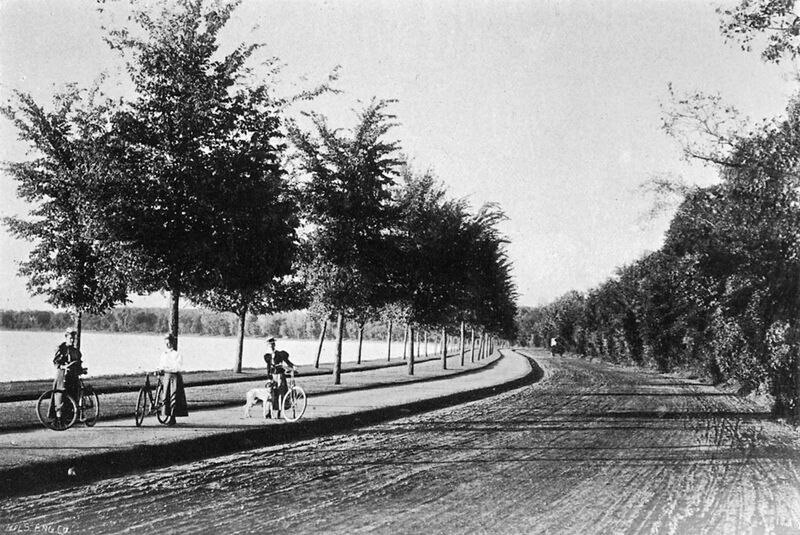 Perhaps most remarkable however, despite the fact that today you could spend more on a bicycle than the park board paid for Lake Calhoun, the basic concept of the bicycle has not changed at all: two wheels on a connecting frame, pedals, seat, handlebars—and a dog out for exercise. Another thematically related passage from Phelps’s 1912 report is worth noting. I have no idea if Phelps was a stockholder in The Toro Company. 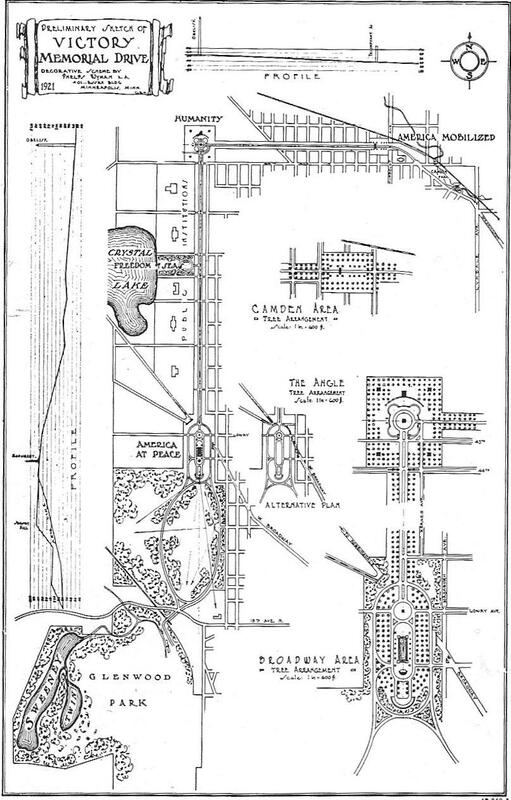 The parkway Phelps recommended was never authorized or built, but parks have been acquired along much of the route he suggested. 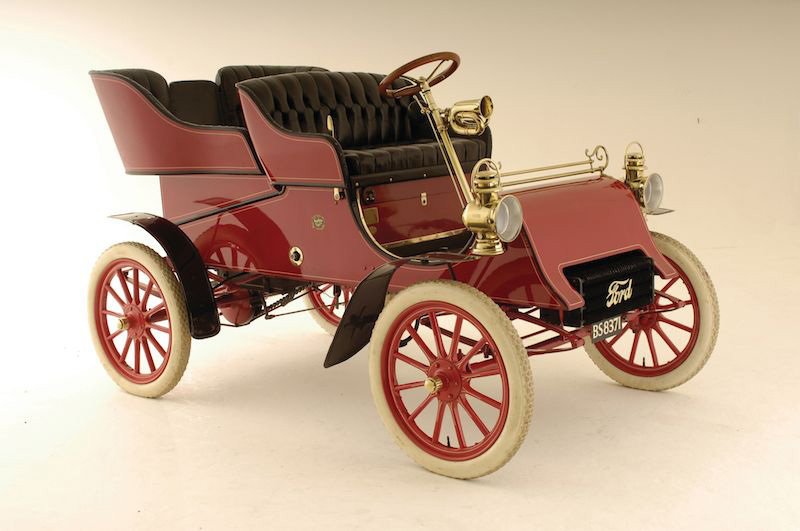 Phelps vision of automobiles, transcontinental highways and “Greater Grand Rounds” is not surprising given his early adoption of the automobile himself. Phelps first appearance before the park board, more than a year before he was elected to be a park commissioner, was on behalf of the Automobile Club of Minneapolis. On May 7, 1903 Phelps requested permission for the club to have an automobile hill-climbing contest on the steep hill on Kenwood Parkway near Spring Lake. Hill-climbing contests were an early form of car racing, seeing whose car could climb a steep hill in the shortest time. As an inducement for approval of the club’s request perhaps, Phelps invited park commissioners and friends to attend the contest and afterwards be given a ride by automobile around the parkways. Phelps’s request for use of the parkway was approved, but he may have gotten more than he bargained for. Immediately following approval of his request, the board directed the Privileges and Entertainments Committee to meet with the City Council Committee on Ordinances to develop an ordinance governing the use of automobiles in parks. Anyone convicted of violating the ordinance was subject to a fine of $2-$100 and, if in default of payment of a fine, imprisonment in the City Work House for a period of up to 90 days.
. The success of those vehicles is still evident in Minneapolis where we refer to the Ford Dam and Ford Bridge, named for their proximity to and relationship with the Ford assembly plant in St Paul. The construction of the Ford Bridge made Minnehaha Park easily accessible to St. Paulites. Here’s an exclusive club: William Watts Folwell, Thomas Sadler Roberts and Edward Foote Waite. Each has had a Minneapolis park property named for him, and each also received an honorary degree from the University of Minnesota. 1925 was a big year for Folwell when, at age 92, he received the first honorary Doctor of Laws degree ever awarded by the University of Minnesota and Folwell Park was dedicated in his honor. The name for the park had been chosen in 1917, but it took eight years for the park to be finished and dedicated. Folwell was hired as the first president of the University of Minnesota in 1869. He was elected to the Minneapolis park board in 1888 and served on the board — many years as its president — until 1906. He was the first to propose the name “Grand Rounds” for the city’s ring of parkways. 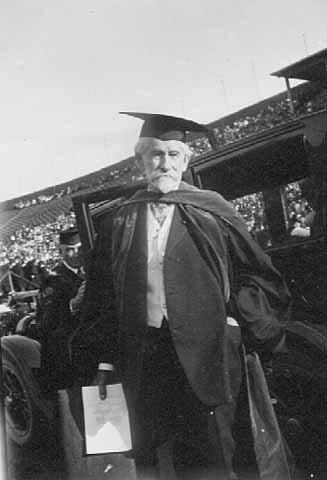 He is pictured in 1925 when he received his honorary degree, apparently in ceremonies at Memorial Stadium. Photo: Minnesota Historical Society. Roberts was awarded an honorary Doctor of Science degree by the University of Minnesota in 1940, when he was 82. 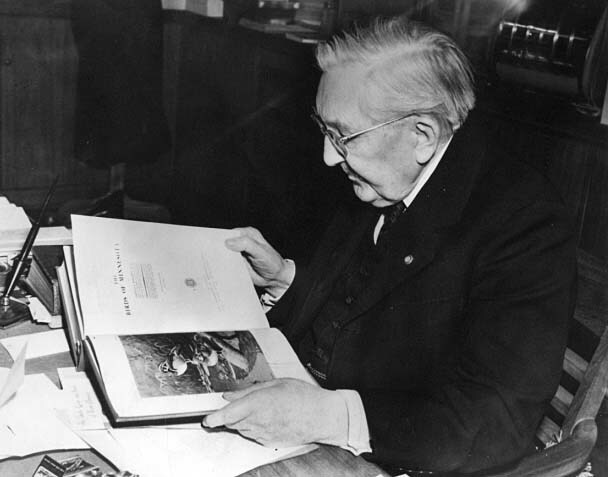 In the photo, taken sometime that year, he is perusing a book of Audubon prints. The Thomas Sadler Roberts Bird Sanctuary in Lyndale Park near the north shore of Lake Harriet was named in his honor in 1947, a year after his death. Roberts was a doctor known for his extraordinary capacity to diagnose unusual diseases and illnesses largely due to his prodigious memory. He retired from medicine in his 50s and devoted his time to ornithology. 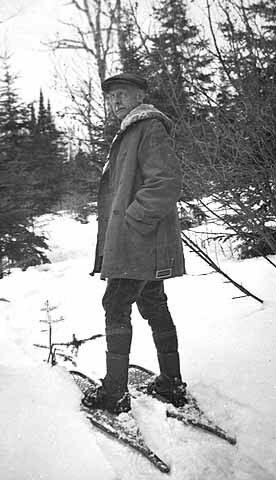 He taught at the University of Minnesota and was a director of the Museum of Natural History. Photo: Minnesota Historical Society. Waite received his honorary degree from the University of Minnesota and had a Minneapolis park named for him in the same year — 1949 — when he was 89. His Doctor of Science degree honored a legal career best known for years of service as a juvenile court judge in Minneapolis. But he was far more than a wise and compassionate judge; he helped shape the field of juvenile law in the United States. Waite is less well-known for his five-month stint as Minneapolis’s police chief in 1902. It was not an easy job in the wake of a scandal known nationally as the “Shame of Minneapolis,” centered around corrupt Mayor Albert Ames and his brother Fred, whom he had appointed police chief. David P. Jones was appointed mayor to replace the fugitive Mayor Ames and turned to his friend, Waite, an assistant district attorney with no police experience, to clean up a corrupt police force and restore public faith in law enforcement. Waite Park was developed along with Waite Elementary School as a joint project between the park board and school board from 1949-1951. The park and school opened for the 1950 school year but final improvements to the site were not completed until the following year. From this very exclusive list it would appear that the good do not die young. Has the Park Board Neglected Northeast Minneapolis? While writing recently about Alice Dietz and the marvelous programs she ran at the Logan Park field house I thought again about the perceived neglect of Northeast and whether it might be true. I concluded that it is not; northeast Minneapolis has been a victim of industry, topography and opportunity, but not discrimination or even indifference. What’s more, all those elements have now realigned, putting northeast Minneapolis in the position to get a far bigger slice of the park pie in the foreseeable future than any other section of the city.